Dream Lake in Rocky Mountain National Park features one of the most iconic locations in the state of Colorado. Hallet Peak and Flattop Mountain dramaticaly rise above Dream Lake, creating a post card perfect scene. As all Photographers know, sometimes Mother Nature gives you lemons and you need to make lemonade. Dramatic sunrises and windless mornings at Dream Lake dont happen as often as we photographers make it appear. It's on these days that I find myself looking for more intimate scenes of these iconic locations. On this day, I turned my view camera away from Rocky's peaks and found a more pleasing view along the shores of Dream Lake. 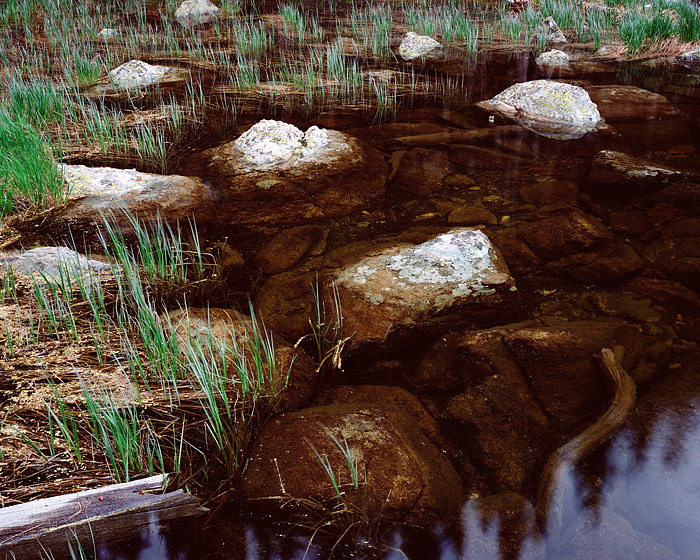 Rocks and grasses rise out of the shallows of a placid Dream Lake on a cloudy, overcast morning. I often find scenes like these more rewarding to photograph than the often photographed Colorado iconic views. Photo © copyright by Thomas Mangan.